The Site Audit tool is now available in its new format! We’ve redesigned it to make it easier than ever to monitor progress on a website’s health and to improve User Experience. The Overview Report has been transformed beyond recognition. 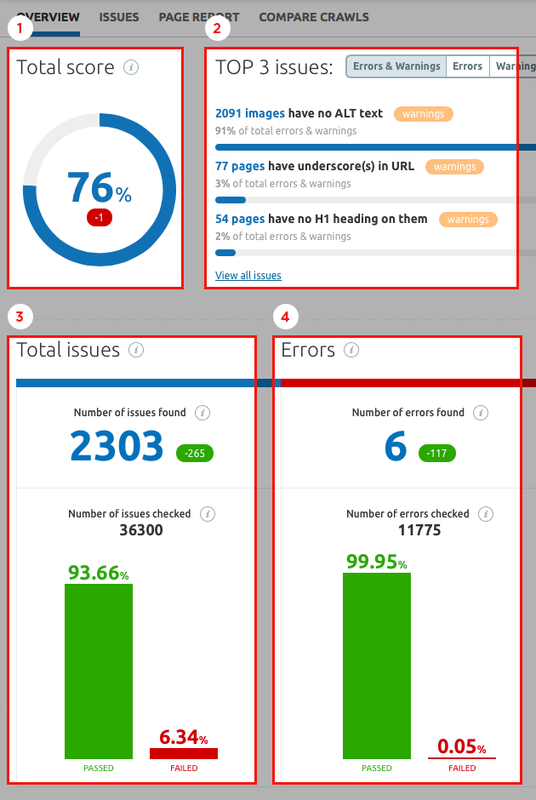 Now your website gets a score (1) that is based on the ratio of found errors to the number of performed checks. The Top 3 Issues section (2) lists the most frequently found issues on your website. You can click the corresponding tab to view the top errors, the top warnings, or both simultaneously. 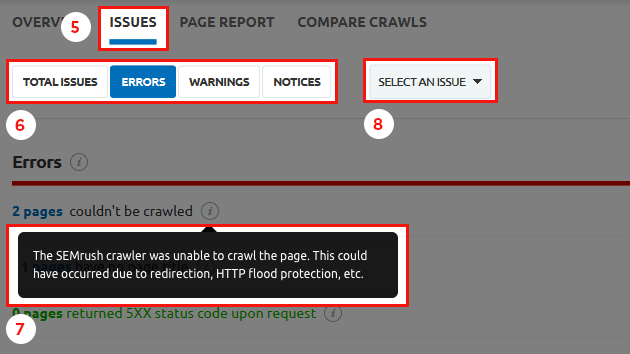 In the Total Issues column (3), you will find all issues (including errors, warnings, and notices) detected on the website during the last audit. This column also includes the total number of issues we checked on all visited pages, links, and images. The red and green visuals show the ratio of all passed checks to failed checks. The same information is available separately for errors, warnings, and notices (4). The Issues Report (5) shows all the issues that we checked. You can view a detailed list of all issues, errors, warning, or notices by clicking on the corresponding tab (6). For every problem, you will find a tooltip (7) explaining how it can negatively impact your website. Use the selector (8) to see a particular issue and its affected pages. The Compare Crawls report (9) shows the difference between two audits (10). It helps you keep your website’s on-page health under control. You can use selectors (11) to choose audits you’d like to compare. The Issues and Compare Crawls reports can be exported into XSL and CSV formats (12). 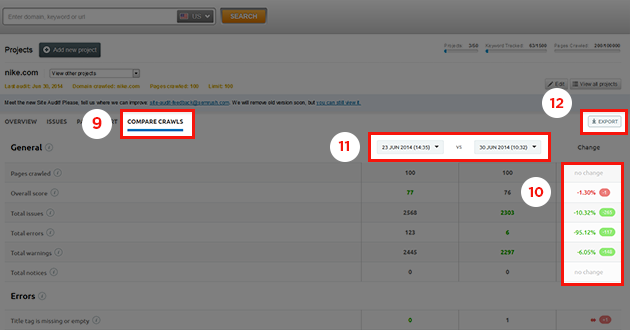 We’d be glad to know how you like the new Site Audit tool. Please send your feedback to [email protected]. All old Site Audit reports will soon be removed.